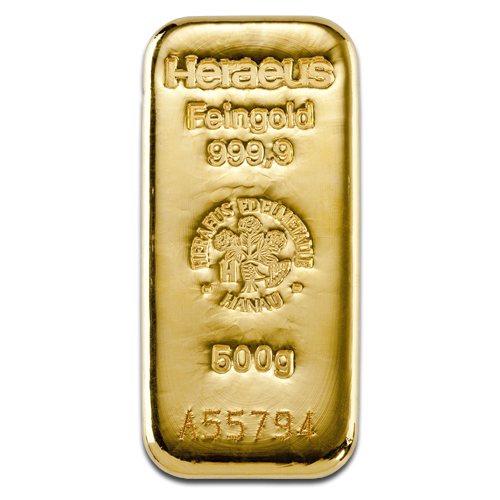 Buy the Heraeus 500g gold bar to increase the value of your gold investment or to hold in a pension portfolio. Heraeus is a leading LBMA approved German refiner with a proven track record for quality products that meet the demands of today's precious metals collector. This larger 500g investment bar offers exceptional value for money and each contains 500 grams of .9999 pure 24 carat gold. Bars are sealed in dustproof and tamper evident packaging and each bar has its own unique serial number. These cast gold bars are attractive as well as valuable and they measure 91 mm x 40.5 mm x 7.5 mm. Each bar shows the Heraeus crest and the weight and purity of the gold. Gold is the world's most popular metal and is proven to be a very safe haven for capital as well as an investment that will retain its value whatever the economic climate. 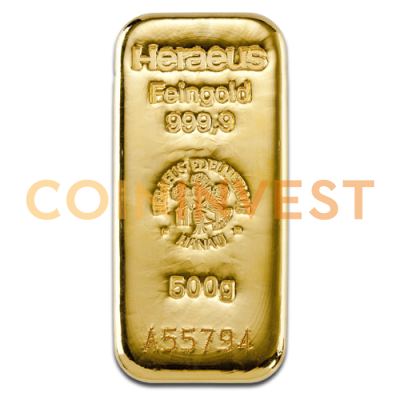 At CoinInvest.com, we make it easy for you to buy the gold investment products you really want, like this Heraeus 500g gold bullion bar. All orders are shipped quickly and securely and you are guaranteed the lowest possible prices.